Cold Heart's Foundation. : It's gonna be legen - wait for it - dary! “I don't hate people, I just feel better when they're not around” -Charles Bukowski. So I typed "Croatan" in Google Search, for I wanted to get some .gifs to post here from my favorite episode of Supernatural, yet. And to my surprise, people actually google'd "Croatan Virus". Like, seriously? It's so stupid. For people who don't know, Dwayne (whose parents have already died and he doesn't know yet) comes in and they all check him for the virus. Dwayne: Has anybody seen my mom and dad? 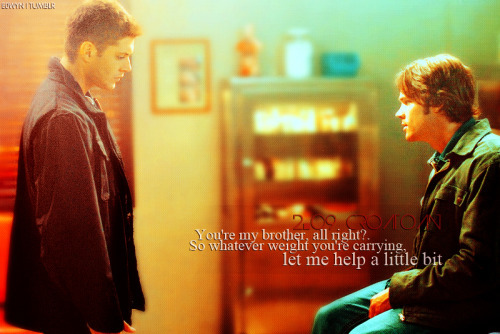 Dean (whispers to Sam): Awkward. Dean: Heh. Well, you are a handsome devil, but I don’t swing that way. Sorry. Dean: Well this ought to be a relaxing drive. Sam: Didn't you pay any attention in school? Sam: That's not school! That's Schoolhouse Rock! Sam: This is the dumbest thing you've ever done. Duane Tanner: You aren't gonna shoot me! Dean: You're gonna shut your pie hole, or I still might. "Is the Croatoan Virus some sort of Demonic HIV?" I find humans annoying, and interactions wasteful. when I grow up, I wish to be a mermaid. I like scars, imperfections, wicked stuff. I don't like eating, but looking at food and how it is made. Copyright © Cold Heart's Foundation.